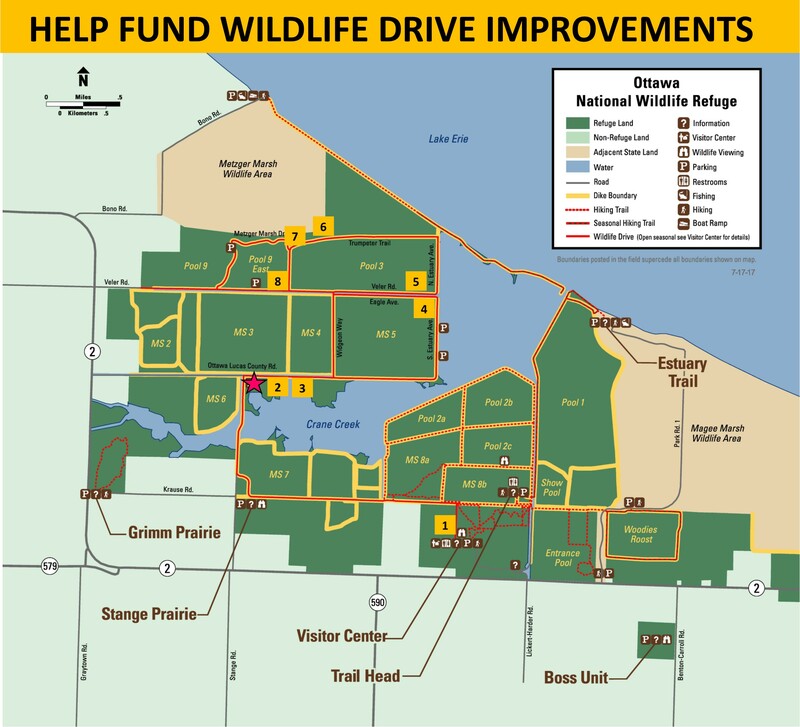 Help to improve and maintain the Ottawa Wildlife Drive. We know you love the Wildlife Drive at Ottawa National Wildlife Refuge. The drive allows folks to explore wetlands, woodlands, and prairies without ever having to leave the comfort of their own vehicle. Prior to 2012, the Ottawa Wildlife Drive was only open once a year. Refuge staff recognize how the Wildlife Drive connects visitors to nature, so they have asked us to help with an improvement project that we are sure is important to you, too. Some simple improvements would make the Wildlife Drive a more pleasurable experience for all. As resources allow, the refuge staff plan to install more pull-offs in strategic locations allowing you to view wildlife through "windows" in the habitat. The refuge would also like to add interpretive signs in key locations, as well as improved directional signage to help visitors navigate the drive. An early exit is another option that the refuge is working to include in their improvement plan. And, one of the most suggested amenities is also on the refuge's radar... a place to "go" near the midway point! Funds raised for this project will help the refuge to make some of these improvements and help to maintain these improvements over time. Donate today for an improved Wildlife Drive experience! Are you or your company/organization interested in sponsoring a pull-off? The average cost for pull-off installation is $2,000 depending on location. Call 419-898-0014 x13 and chat with the Friends group for more information. #1-8 on the map are strategic locations the refuge hopes to install pull-offs and "wildlife windows", and the pink star will be the location of a portable bathroom. Donate today to help make these improvements to the drive you love!